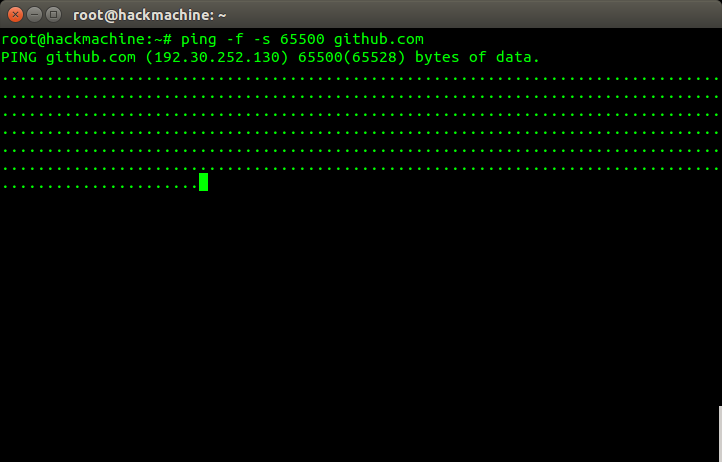 Why does ping -f act like this? I'm using this command to try a sample DoS attack. Is there any better command than this one? Maybe a command specialized for HTTP? So, your first screenshot says that for every packet sent a reply from the server has been received. Your second screenshot says that a few packets have been lost since you started the command. 3. Performing Denial of Service attacks on somebody else's servers is illegal in many jurisdictions. I'm sure you're talking about stress-testing your own web servers and I suggest you to edit your question to reflect that. Most Linux tools for benchmarking and stress-testing will work in Ubuntu, there's no need for Ubuntu-specific documentation. Not the answer you're looking for? Browse other questions tagged ping or ask your own question. Can I use ping to see real time drop rates? What non malicious uses are there for ping's flood (-f) option?